Mix together all of the kofta ingredients until well combined. Form into 12 small flat patties (think slider sized). Heat canola oil in a large skillet, cook the kofta until cooked through, flipping once, about 5 minutes on each side. Drain on paper towel-lined plates. Meanwhile, stir together all of the tzatziki ingredients until well distributed. Set aside. 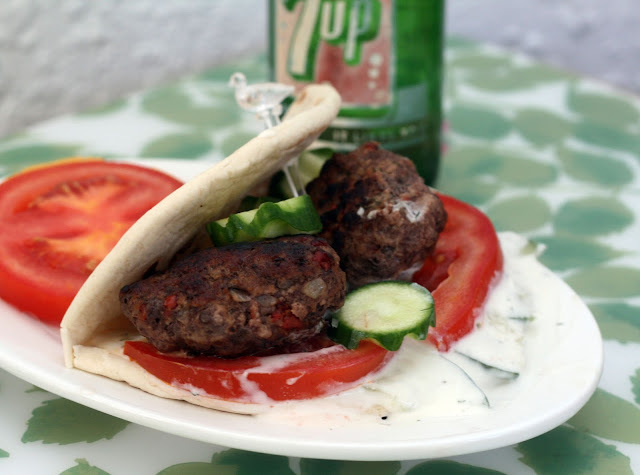 Spread the bread with tzatziki, top with two kofta, tomato, and cucumber. Serve immediately. The idea for these came to me when I was visiting the new location of Trader Joe's out in the suburbs. I have a love/hate relationship with Trader Joe's but I do love their sundried tomatoes because they are not packed in oil. Oil-packed is good for some recipes but when I'm using it with other heavy ingredients like meat, I really prefer the dry kind. Anyway, their ground beef isn't as overpriced as most of their meat so I picked that up and voila, Dill-Sundried Tomato Kofta Sandwiches were born. I made these for lunch because Matt is working from home today but they are definitely hearty enough for dinner when served with some veggies or a salad. We were both surprised at how well the dill came across in the burgers. It really lightened the flavor of the kofta and pulled together the whole sandwich. Plus it was super quick to make, I slept in and was only half awake when I made this and it still came out awesome and in under about 25 minutes. In the bowl of a stand mixer or in a mixing bowl using a hand mixer beat the cream and sugar together until soft peaks form. Meanwhile, lightly crush 1/2 of the raspberries (I did this by hand but the back of a spoon will do) and set aside. When the peaks have formed, remove the bowl from the mixer and use a large spoon to gently fold in the crushed raspberries (do not thoroughly incorporate) without deflating the cream. Crumble the meringues over the mixture and gently fold them in. Divide into bowls. Top with remaining berries. Serve immediately or refrigerate 1/2 hour. Best eaten the day it is made. One of the biggest disappointments of my trip to England last year is that when we were in Windsor, a mere footbridge away from Eton during strawberry season, we did not get a single chance to eat Eton Mess. It was a major goal of mine for the trip. At least I got to see the castle. There is a popular story that when at Eton cricket match a dog knocked over the prepared dessert, meringue and strawberries (I'm assuming a pavlova) crushing it and to salvage it, an enterprising chef tossed it with some whipped cream and served it anyway. The truth seems to be that some chef started selling it in the Eton snack/sweets shop in the 1930s but I like the dog story better. Traditionally it is made with strawberries but our yard is overflowing with golden and red raspberries so I thought I'd make it using raspberries instead. The raspberries crushed much more easily than strawberries that made the dessert (pudding!) even quicker to make. OMG is so good! Simple, even though I did make the meringues from scratch so that took some time, but surprisingly light tasting and full of fresh raspberry flavor. 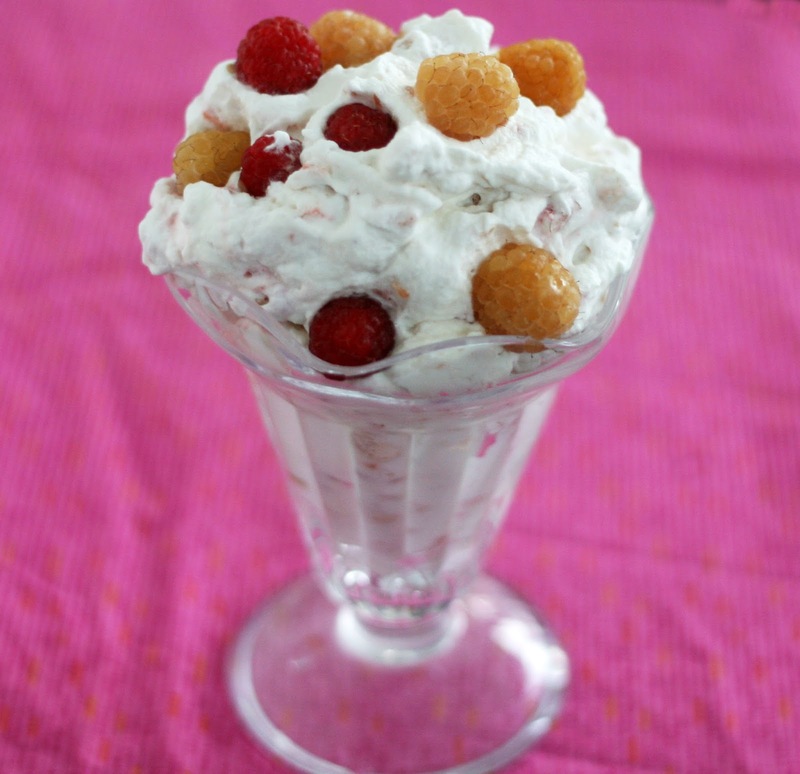 I loved the pockets of chewy meringue in the fluffy, creamy, fruity whipped cream. I can't wait to make it again. Preheat oven to 250. Line a baking sheet with parchment paper. Set aside. Place the raspberries in a Vitamix, mortar and pestle or food processor and grind until it forms a powder. Whisk the mixture through a fine sieve to remove any seeds/chunks into a bowl. Measure out 3 1/2 tablespoons of powder. Place in a bowl and whisk in the sugar. Meanwhile, in the bowl of a stand mixer or a regular bowl and using a hand mixer, beat the eggs, salt, and cream of tartar together until soft peaks form. While the mixer is still running, slowly stream in the raspberry/sugar mixture. Beat until stiff peaks form. Using a regular dining teaspoon and your fingers or a second spoon, place heaping spoonfuls of meringue on the lined baking sheet. They can be close together as they will not spread. When all of the meringue is on the baking sheet, place it in the oven for 1 1/2 hrs. 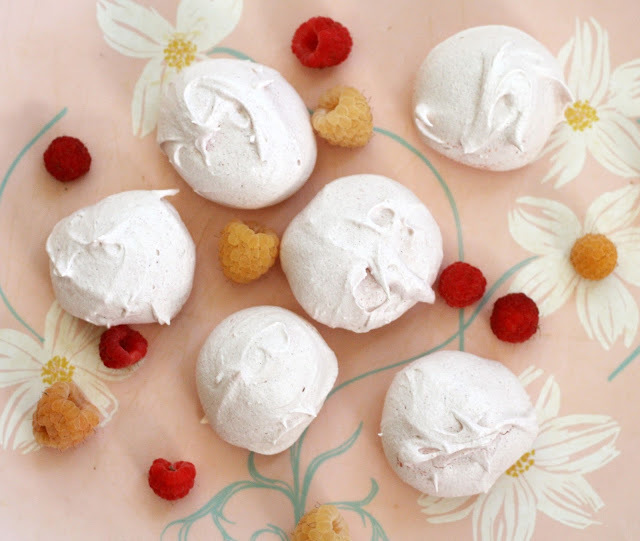 After the time is up, turn off the oven, leaving the meringues inside, and let them hang out for one hour. As you may have guessed, I am not one for fussy details. I piped exactly 3 meringues before the bag started to leak so I thought I'd go rustic. You can, of course, pipe your meringues if you want them extra cute but it really isn't necessary. I get a lot of emails from people who say they don't bake because they don't know how to make swirly icing or they don't have piping bags and I am here to say you really don't need them. These meringues are just as tasty and for what I am ultimately doing with them (Raspberry Eton Mess), their appearance doesn't matter. Frankly, even if you were serving these as-is they are tasty and pretty and people will be so impressed you made them yourself vs. buying them at the store (which I was tempted to do) they won't care what they look like. I was really excited to remember that I had some leftover freeze-dried raspberries from making my Very Berry Rice Krispies Treats so rather than boring vanilla meringues I could make raspberry ones! Any freeze-dried fruit should work. The flavor is light (as are meringues!) but very raspberry-y and it turned them into a very pretty pink color. Heat 1/2-inch canola oil in a large skillet. In a medium bowl, whisk together the mustard, Old Bay, egg and mayo until smooth. Add the crab and bread. Form the mixture into 5-6, 3-4-inch, 1/2 inch thick patties. Place in the pan and cook, turning once, until golden brown on both sides and heated through (about 5 minutes on each side). They are a little more fragile than some so take care to only flip them once. Drain on paper towel-lined plates and serve. 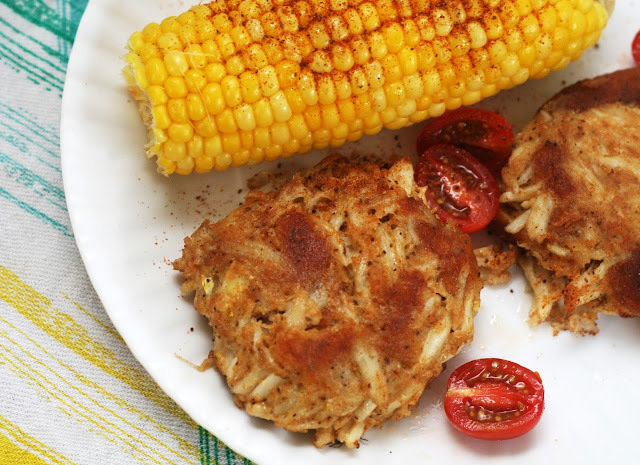 I've made Baltimore (or Maryland if you prefer) crab cakes a lot. I've posted the method I personally use most frequently which is similar to what I grew up eating and the another method that I didn't grow up with but that is also very popular which uses crushed saltines as the binder. I haven't posted one using bread crumbs yet (another popular method) but maybe one day. This recipe is basically a richer version of what I grew up eating. It uses eggy, slightly sweet brioche (I buy the sandwich loaf brioche at Aldi) to bind, mayonnaise for a really creamy texture, and straight jumbo lump (no backfin). The result is a more decadent crab cake that is just as simple to make as "normal" crab cakes. Perfect for making a weeknight special. Spray a skillet with nonstick spray. Quickly saute the meat until the meat is just barely cooked on all sides. Add to a 4-quart slow cooker. Stir. In a small bowl, stir together the chipotles in adobe, tomatoes, beans, vegatables, and spices. Pour over the meat mixture. Stir to evenly combine. Cook on low 7-8 hrs and then high until ready to serve (up to 2 hours). Stir prior to serving. A rainy summer day calls for a slightly summery take on the usual slow cooker chili. I say this every year but it is true, I like using my slow cooker way more in the summer than I do in the winter. In the winter, I don't mind the stove and oven heating up the house but in the summer, in my 1930s house with only a window unit to cool the whole first floor, baking and boiling hold little interest. It isn't as if every summer meal is going to be a salad or sandwich or made on the grill (although we do a lot of all that) some are going to be hot and made indoors! Might as well make use of the slow cooker! 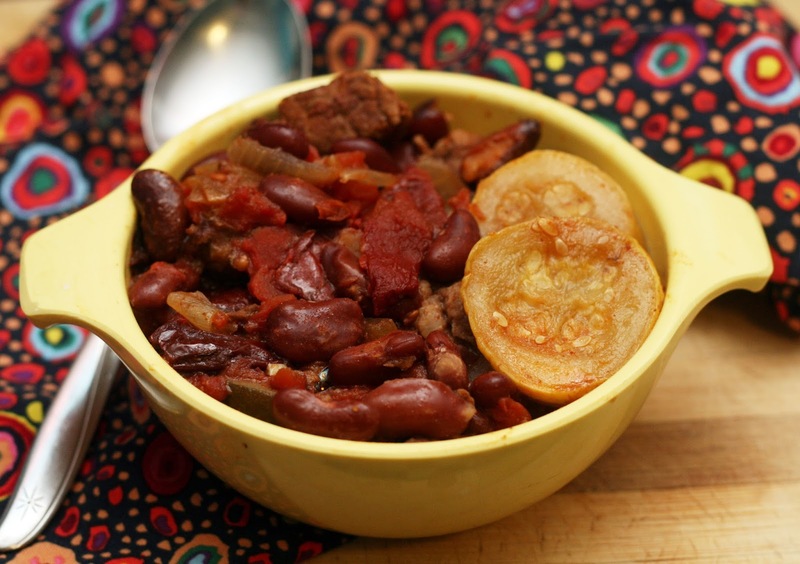 This chili is on the spicy side and quite hearty. I like it with some sour cream on top to take the edge off. It also makes great use of summer squash--something I am already seeing in abundance. Perfect for a hot, steamy rainy summer evening. Lightly steam the caulflower and broccoli. Drain and allow to cool. Place in a large bowl and toss with olive, onion and feta. Set aside. In a small bowl, whisk together the olive oil, vinegar and spices. Drizzle over vegetable mixture. Toss to evenly distribute. Refrigerate and serve within 24 hrs. 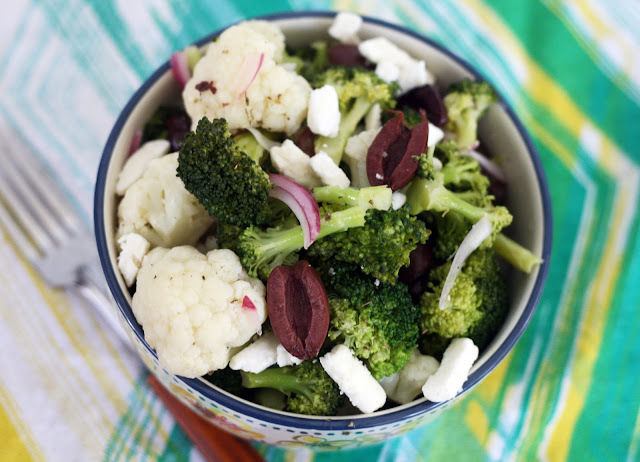 I've never been to Greece so I'm not even sure they are big cauliflower or broccoli eaters but my favorite flavors from Greek cuisine inspired this simple salad. Cauliflower and broccoli can be a bit blah so I am always trying to think of new ways to dress them up. This salad is full of flavor from the vinaigrette, olives and cheese yet it takes like 10 minutes to pull together which is about where my attention span is right now. I say work smarter, not harder. Preheat oven to 350 degrees. Beat butter and sugar until light and fluffy. Beat in egg and vanilla. In a separate small bowl, mix dry ingredients. Add the dry ingredients and coconut milk alternately, beginning and ending with the coconut milk. Pour evenly into two buttered and floured four-inch pans. Bake for 15-20 mins until golden brown and a toothpick comes out clean. Let cool 5 mins in the pan. Remove from pan and let cool completely on a rack. If the tops are very domed, slice the top off one to make it flat and use it to make the bottom layer of the cake. In a large bowl, beat together the vanilla/rum, cream cheese, and confectioners sugar until smooth. Add more confectioners sugar in 2 tablespoon increments if you want or need a stiffer or sweeter frosting. 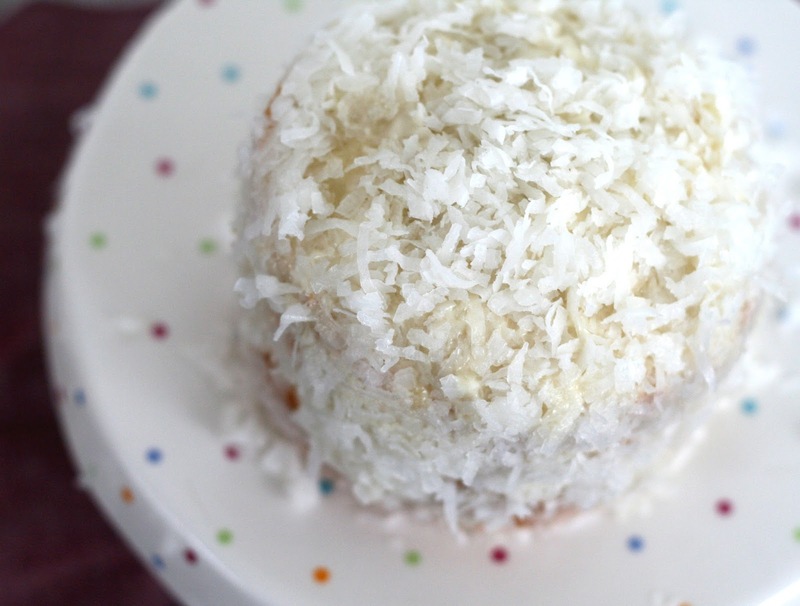 Take out 1/3 of the frosting and mix with 1/3 of the coconut flakes. Spread top of one cake and place the second cake on top. Spread the remaining frosting over the cake and coat with coconut. We were going to buy Matt's birthday cake at a bakery this year so we could focus on picking crabs and not baking but we realized that since his birthday is Memorial Day this year and the day before is a Sunday, both bakeries we thought about ordering from would be closed. Since it is just the two of us, I ordered this set of tiny cake pans and made a teeny-tiny layer cake. It was a little tricky to figure out the proportions (and you might find you have a bit of icing leftover but better too much than too little right?) but basically it is a regular cake scaled down by nearly 3/4. This cake would also be perfect for a child's birthday (they could have their own cake all to themselves!) or even made in multiples for an event. I'm kind of looking forward to making more tiny layer cakes down the line. It is just too cute!